This page will help you to get up to speed with InstaLOD for Autodesk VRED. InstaLOD for Autodesk VRED enables you to optimize 3D meshes without having to leave your favorite DCC tool. The integration features a graphical user interface, supports optimization, uv and occlusion culling operations. Great care has been taken to ensure a high degree of usability and productivity even when using InstaLOD for VRED for the first time. Please refer to the InstaLOD Pipeline documentation for an overview of all features. Teams using InstaLOD have the option of getting a private instruction session. Please get in touch with us to schedule your session. 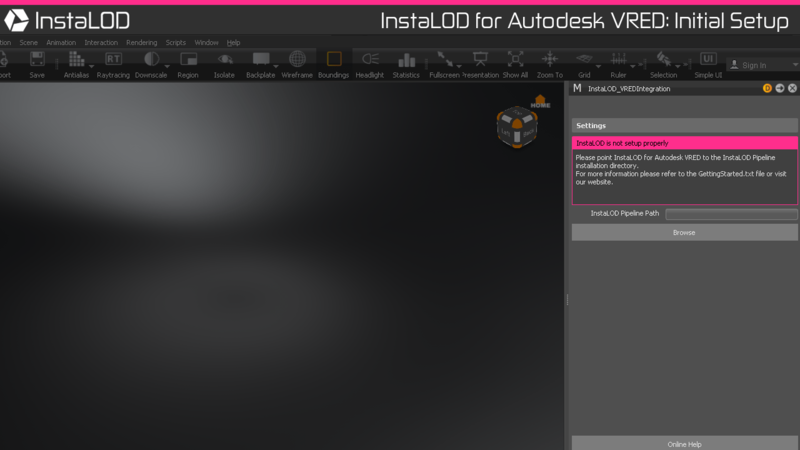 InstaLOD for Autodesk VRED runs on both MacOS and Windows. The following versions of Autodesk VRED Pro and Design are supported as a plugin: 2017, 2018, 2019 and later. The following versions of Autodesk VRED Pro and Design are supported as a script executed from the Script Editor: 2016, 2017, 2018, 2019 and later. InstaLOD for Autodesk VRED uses InstaLOD Pipeline as backend for optimization operations. InstaLOD Pipeline must be installed before you can start using InstaLOD for Autodesk VRED. Please refer to the InstaLOD Pipeline documentation on how to install InstaLOD Pipeline on your workstation. InstaLOD for Autodesk VRED supports authorizing licenses and displaying license info from within VRED. Once you have installed and authorized InstaLOD Pipeline on your workstation unzip the InstaLOD for VRED file distribution. VRED plugins are installed into the user plugin folder or into the systemwide plugin folder of your VRED distribution. VRED versions before 2017 don’t support plugins as such. The InstaLOD for Autodesk VRED script code can be copy and pasted into the Script Editor and executed directly. Copy the InstaLOD_VREDIntegration.py file to your VRED plugin folder, usually found at C:\'username'\Documents\Autodesk\VRED-'internalVersion'\ScriptPlugins. Copy the InstaLOD_VREDIntegration.py file to your VRED plugin folder, usually found at /Users/'username'/Documents/Autodesk/VRED-'internalVersion'/ScriptPlugins. Once the integration’s script file is copied to your VRED plugins folder you can start VRED. If the InstaLOD window has been closed, it can be spawned again by selecting Scripts->InstaLOD_VREDIntegration from VRED’s main menu. Older versions of VRED don’t support plugins but the script code can be executed manually by the user. The Script Editor can be found in Edit->Script Editor. Copy and paste the python code of the InstaLOD for VRED source file into the Script Editor and hit Run. The script will spawn automatically a new window. On the first start of InstaLOD, it is necessary to point InstaLOD for VRED to the installation directory of InstaLOD Pipeline. If InstaLOD Pipeline was found in the specified directory the window contents will change. If your machine has already been authorized for InstaLOD you can start using InstaLOD for Autodesk VRED now. Click the Optimize Selected Meshes button to optimize the mesh. VRED will export the geometry for InstaLOD and start the optimization. If asked whether the environment Geometry should be exported, select NO. Once the geometry has been exported InstaLOD will execute the mesh operation asynchronously. 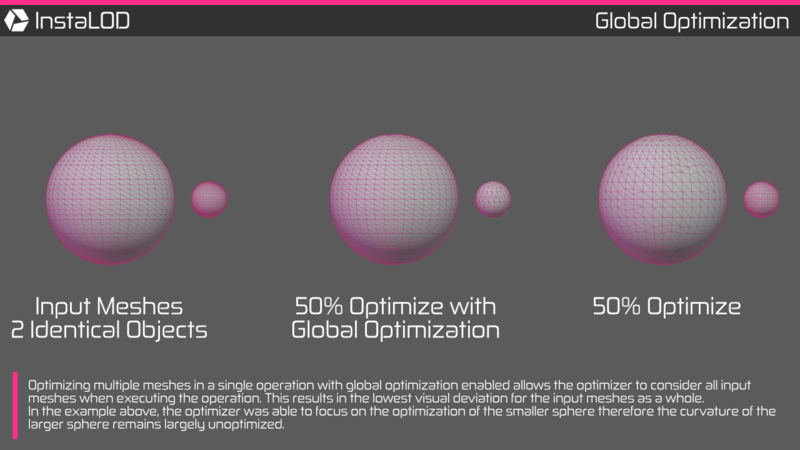 InstaLOD SDK 2 introduced a new feature called ‘Global Optimization’.